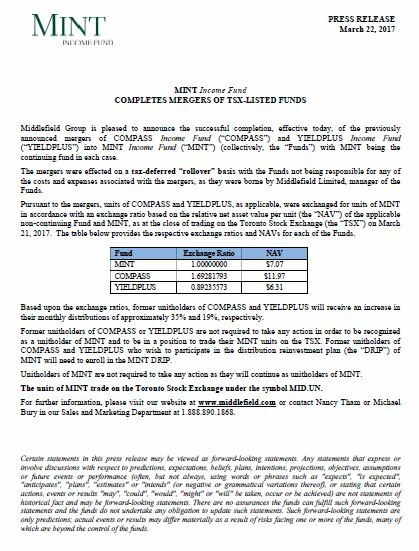 As of March 22, 2017, the fund merged with MINT Income Fund. COMPASS Income Fund invests in a diversified portfolio comprised primarily of equity income securities. Over several decades, dividends have benefited investors by accounting for approximately two-thirds of total equity returns and dampening the volatility associated with investing in equities. In addition, dividends from Canadian corporations have become increasingly tax efficient and are now taxed at a lower rate than interest income. We continue to believe that companies offering high levels of sustainable income will attract significant investor interest and receive premium valuations, especially within an environment of relatively low interest rates and a Canadian market with few alternatives for investors seeking yield. Virtually all income trusts, including oil and gas royalty trusts, have converted to dividend-paying corporations. We believe many of them are well positioned to pay out relatively high and stable levels of income, primarily in the form of tax-efficient dividends. Wealth Professional: Dean Orrico, Where are the attractive opportunities on today's investment landscape?